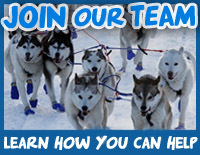 On this page we will bring you information about sled dog nutrition, animal health, natural methods of improving condition and performance, tips to good books, links to specialists in the field of the health and nutrition, recommendations of feeding programs for puppies, racing dogs, senior dogs and those with special requirements, and much more! Please come back later and check for updates. Thank you for your patience while we are developing this page.